1.25" V-Block Anti-Fringe Eyepiece Filter, Kosmos Scientific de México, S.A. de C.V. When using refractor telescopes, it's normal to see some purple-colored fringing or halos around bright celestial objects. 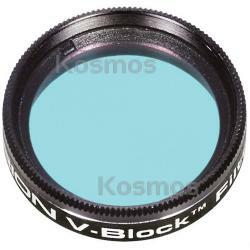 The V-Block filter effectively removes distracting color halos from around bright objects viewed achromatic refractor telescopes. Using a V-Block filter with a refractor telescope can greatly improve sharpness, color, contrast, and resolution of especially bright celestial objects. 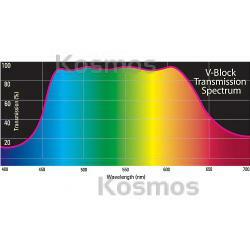 The Orion V-block filter is intended for both visual and astrophotographic use.